String one color of the Martha Stewart beads onto an eyelet pin. Curve the end of the pin into another eyelet with the chain nose pliers. Attach jump rings on both sides. 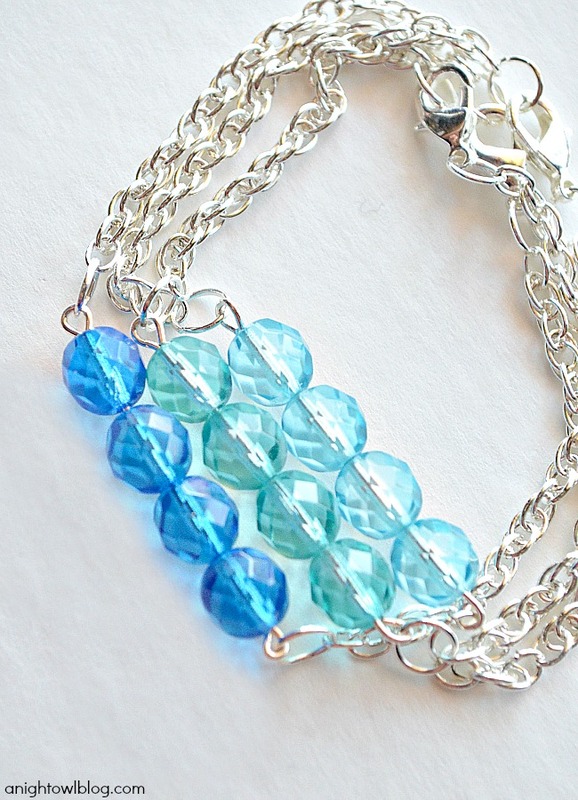 Attach a length of chain to each side (measure according to wrist size). Attach jump rings to both ends of the chain. On one end, attach a clasp, and you’re done! 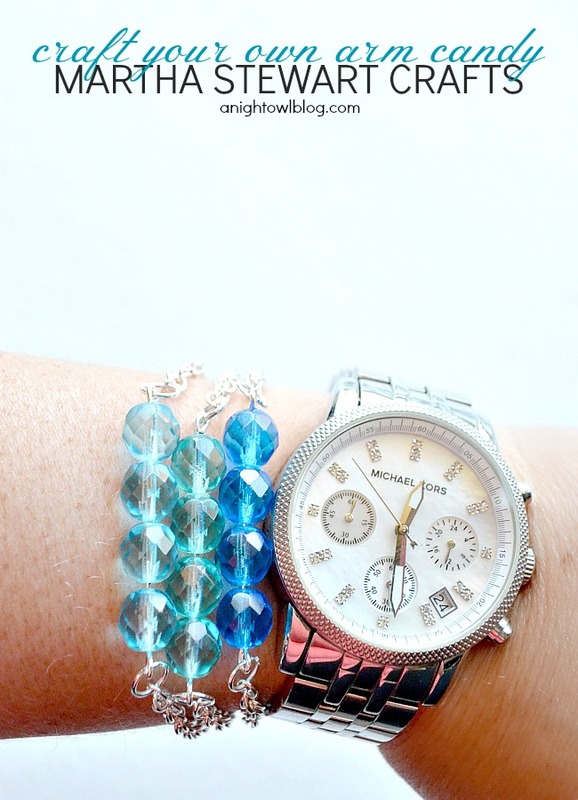 See how easy it is to – craft your own arm candy? I particularly love that you can pick out what colors you need to coordinate most with your wardrobe AND that you can adjust the size to fit YOU! I actually have quite small wrists (I wish I had that issue all around), so I rarely can buy something that isn’t adjustable. Problem solved! 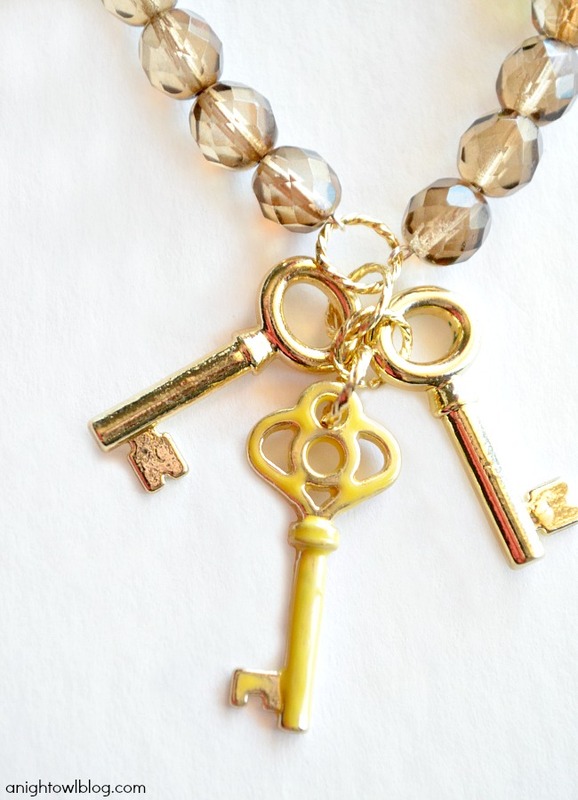 For styles such as these – from now on I’m making my own with Martha Stewart Crafts® Jewelry! 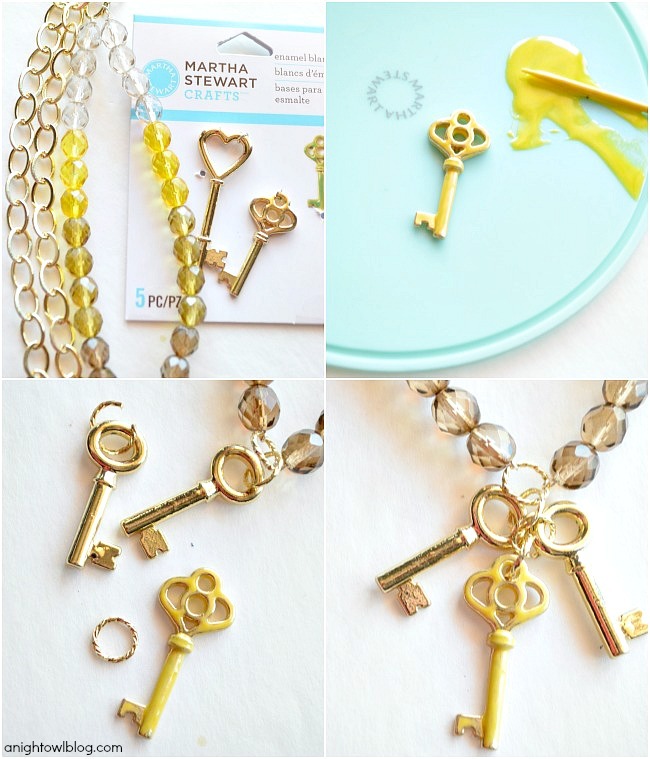 My next favorite piece is this Golden Skeleton Key Necklace! 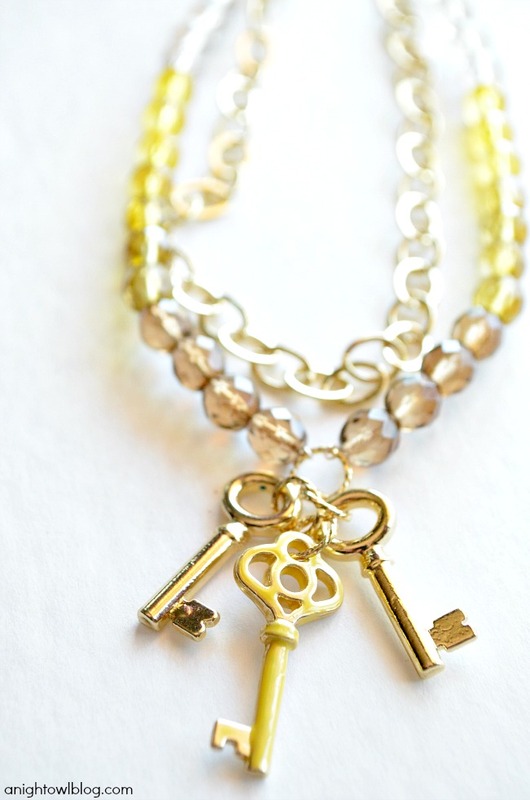 I ADORE everything vintage skeleton keys. Don’t you? They’re just so simple and sweet. So when I saw these charms in the box – I knew I was going to make something with them! Activate yellow enamel by mixing 2 parts activator and 1 part yellow enamel. Let thicken then apply enamel to key charm with toothpick, using the silicone tip brush to erase overflow as needed. Let dry. String brown faceted round beads on gold jewelry wire, attaching to a jump ring on one end and the fat oval gold chain on the other. 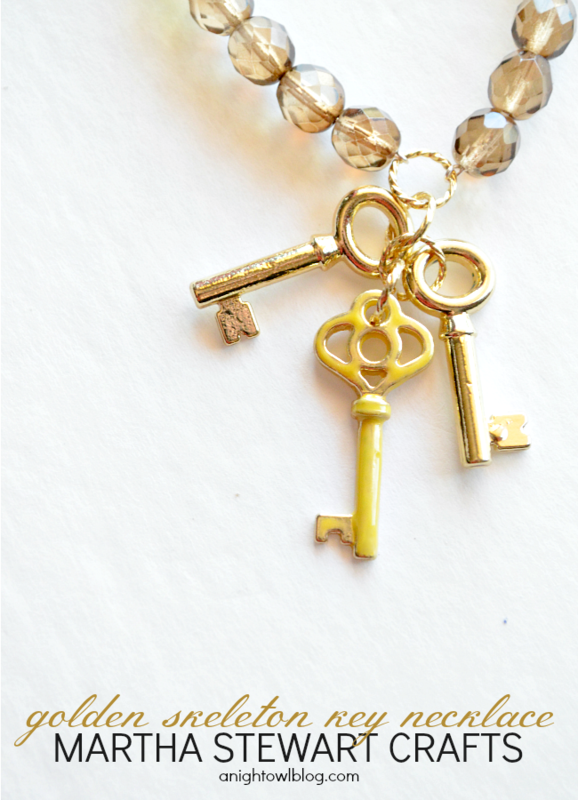 Then attach gold and painted enamel skeleton keys to central jump ring with additional jump rings, and you’re done! A quick note – dealing with the enamels can get messy and sticky! No worries though – make clean up a breeze with some simple vinegar! Great to use to “start over” if need be too. So what do you think? Do you love what I’ve created so far? Like I said, I am NOT DONE! I feel like I’m almost creating a piece a day at this rate! Don’t you want to try now? I don’t blame you. First off, you can currently enter to win $200 worth of Martha Stewart Crafts Jewelry products through the MS LIVING FACEBOOK PAGE! And also, because I really do want to share the love, I’m going to hesitantly part with some of the goodies – to give to one of YOU! 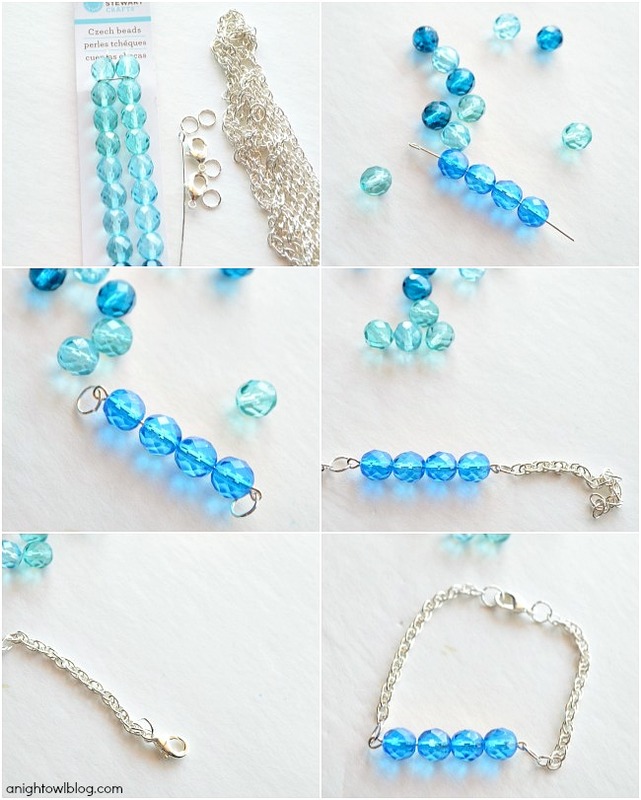 How does a jewelry bundle of beads, charms and more sound? Then enter to win via the Rafflecopter below! US and Canada only; ends 6/7. Good luck!